A respected educator, Benner lectures and teaches workshops internationally in the areas of surface design, textile collage, fused quilt construction, and artistic inspiration. To learn more about dates and times for workshops, a downloadable Workshops Schedule is available. If you are interested in scheduling a workshop or lecture, please contact Benner using Connect. Monoprinting with textile paints can dramatically change the surface of your work, pushing your ideas into new creative territory. Using her fusible collage methods, Benner will demonstrate how to paint and print at different levels of construction, from manipulating a single piece of fabric to the entire surface of the quilt. Through experimentation with opaque and metallic paints, each participant will have the opportunity to create two works: one abstract and open-ended, the other more realistic and image-based. 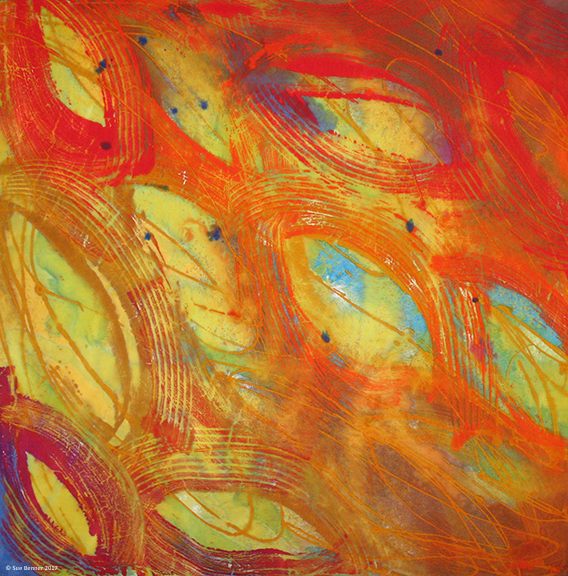 The exploration of abstraction, both objective and non-objective, in the art quilt medium is the theme of this workshop. Benner presents several methods for developing abstract imagery and encourages students to more deeply explore their own personal interests, style and process. Through exercises, slide shows and individual discussions, each student creates a series of works based on source materials brought to class for inspiration. Instruction on using fusible collage as the construction technique is presented, but these concepts adapt to other techniques as well. This is a great class for pushing your personal work. 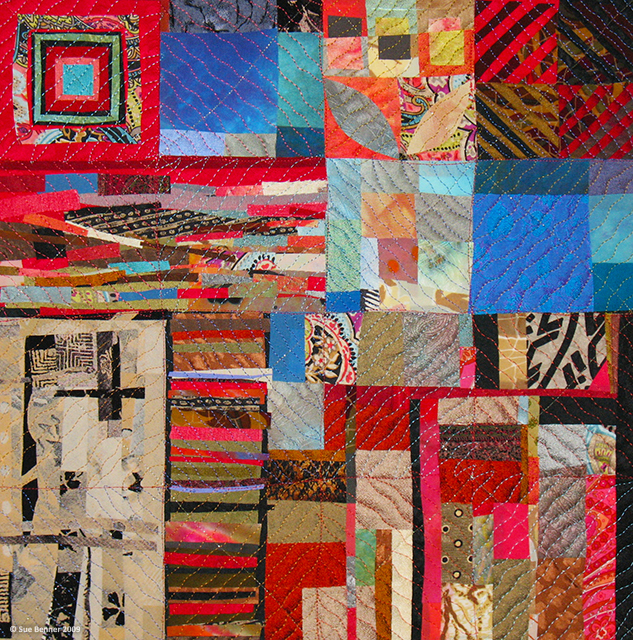 Experiment with the fusion of construction and abstraction with process and technique in the creation of art quilts. Beginning with Benner’s fusible collage methods developed in her series Walking Through Time, she presents a progression of exercises that builds design and technique skills. Participants take this information in their own direction. This is a great workshop for developing new ideas in composition, color, abstraction and sensitivity to proportion. Each day of this workshop is devoted to a different composition challenge. Day one explores squares and rectangles, day two experiments with curvilinear shapes, day three works with collage-and-cut process, and day four deals with landscape. Using step-by-step directions with lots of creative options, each student makes four quilts (each about 16” x 20”) using Benner’s fusible collage techniques. She also covers fusible basics, working with non-traditional fabrics and briefly quilting, blocking and binding. By the end of this workshop experience, construction ideas will abound! Benner began making landscape images from raw edges, selvedges, and other odds and ends from scrap bags. From there she went on to add other techniques and develop a body of work inspired by wetlands in her childhood-home state, Wisconsin. In this workshop each participant creates one or two landscape quilts along with several small studies. The class studies different approaches to representing landscape, including those of other artists in a variety of media. Benner then shows students how to look at a landscape, analyze it and translate it to fabric using a variety of fused construction methods. She also covers fusible basics, working with non-traditional fabrics, quilting and binding the fused quilt. Previous students report that this workshop transforms the way they see the land. Beautiful flowers, concentric patterns, symmetry, block design, use of exotic fabrics and lots of fun are all included in this class. Learn Benner’s layered technique for cutting, assembling and arranging flowers as done in her extensive Flower Series art quilts. This class gives the opportunity to use gorgeous fabrics and expansive color. This exciting construction method is applicable to other designs as well. 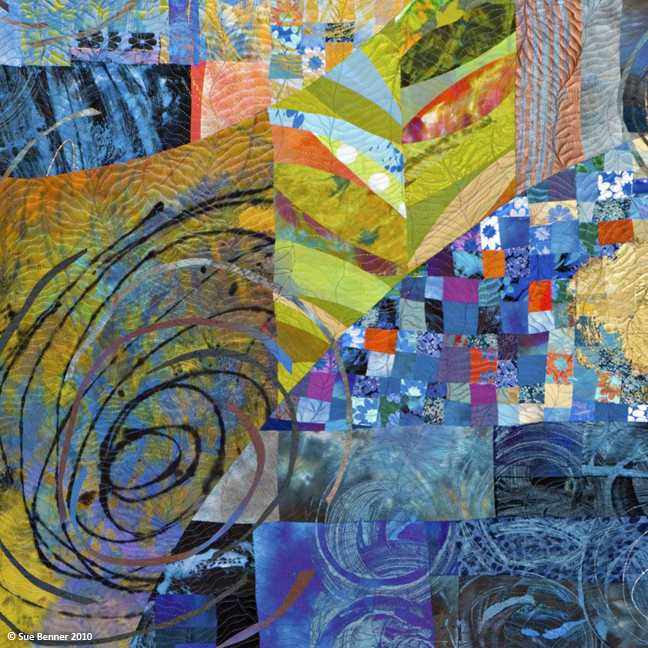 Create a study quilt, then move on to a larger, more involved work with surprising complexity. This class is for artists who have established both their artistic direction and working methods. Make your art and enjoy the community of other artists. Benner’s proposal is to begin a new direction in your work—something you have always wanted to approach. At the same time, works in progress will be welcome. The class engages in discussion and critique to further the development of participants along their artistic paths. Woven into the studio work are discussions on self-expression, developing constructive work habits, managing the artistic life and work and the nature of contemporary quilts in a larger art context. Please note: This class can only be taught in a fully equipped dye studio. Make your marks, brush your strokes, and record it all on fabric. Bold and expressive use of Procion MX dyes is the goal of this workshop. 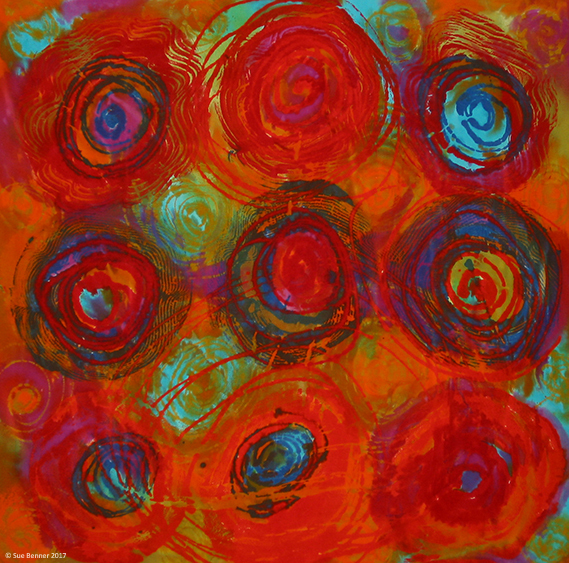 Benner teaches her layered painterly approach using direct application, monoprinting and other techniques. Emphasis is also placed on developing sophisticated color combinations, exploring unusual tools and adding touches of fabric paints. Benner shares helpful hints, technical information and her unique variations in an extensive color handout.